I LOVE the fall season for all the holidays, nonetheleast of which is Thanksgiving. Since we're a relatively young family, I'm still building up our store of holiday related reading material. 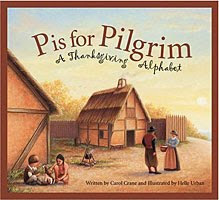 One book that we headed to our collection this year is P is for Pilgrim : A Thanksgiving Alphabet. This book is awesome! It can be used to cover the basics of the holiday (and the letters of our alphabet) or it can be made more complex as it includes anywhere from 2-5 paragraphs of information on each item listed. A is for Atlantic Ocean. There is then information about how the Mayflower traveled across the Atlantic Ocean to land in Plymouth. B is for the Bill of Rights. The Bill of Rights, the book explains, is our "birthright" as Americans and protects our life, liberty and freedom (i.e., things the Pilgrims were rather prone to be interested in). D is for drums, dances, deer moccasins and dyes for clothing. Again, the thing that I so appreciate about this book is that you can keep the read through very simple if you are at the stage where you are building a Thanksgiving word vocabulary. Older readers can learn additional information about the Mayflower, quilting, Races (in our culture), Samoset and Squanto and turkeys. This is a fun and educational way to explore and learn about this particular upcoming holiday. Published by Sleeping Bear Press in 2003, it's a relative "newbie" on the book scene, but worth owning (in my opinion) if you have kids to grow and learn with. I LOVE this series!! They have some of the States and I bought our RI book. Very cute with lots of local flavor. I didn't realize there was a Thanksgiving book. I have now requested it from my library and will no doubt be buying it in the future. Thanks for letting us know about it! We have the Minnesota and Wisconsin books, I didn't realize they had a Thanksgiving book as well. My son is just learning the alphabet at 3-year old preschool. I'll have to look for this book. I bought this book last year and we LOVE it. Definitely worth having in our own library as I know we will use this more and more as the girls get older. :) Now if I could just the Christmas book like this that bought and hid from the girls...seriously!